Hey guys I’m Ash and this will be my Clash Royale guide on how to build a great deck. 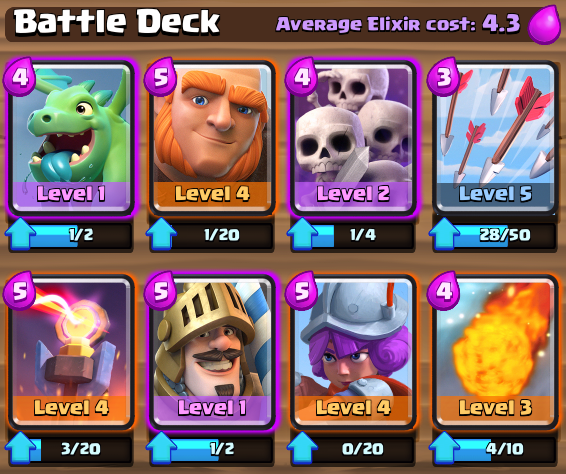 Building a good, well balanced deck is key for success in this game, so in this guide I’m going to break it down in simpler terms, giving you guys the “ingredients” of what’s needed to make a excellent deck. Whenever we’re talking about deck building, it’s always about synergy. You need every card to work alongside each other, and never because it’s a good card. Epic cards are great, but if you’re just using the epic cards solely because they’re “epic” cards, then you won’t have the success you’re looking for. Building a good deck is about synergy, not rarity. Sure you need offense to destroy those Crown Towers and win, but you’re also going to need defense to defend your own towers. So your deck needs a great balance of defense and offense to be successful. Cards that deal “point” damage, which are cards that inflict damage to only one opposing unit (i.e. Musketeer targeting a Giant). Although, point attackers are limited to targeting one unit, they are the strongest damage-inflicting units in the game. Point-damaging cards are necessary for beating high HP troops. Cards that deal “splash” damage, which are cards that inflict damage to multiple units (i.e. Witch targeting a Skeleton Army). While splash damaging units have the advantage of dealing damage to multiple opposing units, they deal among the lowest damage per second in the game. Splash-damaging cards are necessary for beating hordes of low HP troops. You’re going to need a balance of melee and range troops. Ranged troops tend to have low HP but high DPS (damage per second), so it is important to combine them with melee troops in front of them to shield. Having too many melee troops make them susceptible to splash damage, so it’s important to combine them with ranged troops so that your melee troop shields as your ranged troop destroys the splash-damaging threat. Your average elixir cost is important. The best cards tend to have the greatest elixir cost. However, they take the longest to deploy because of their high elixir cost as you will need to wait longer to load up on elixir. It’s a good idea to have an average elixir cost that’s between 3.7 and 4.5. You will find that you’re struggling to constantly deploy your cards if your cost is higher than this. While if your average elixir cost is below 3.7, then you’ll find that although you are able to deploy many cards quickly, you’re struggling against splash-damaging threats as the lowest elixir cost cards tend to be the troops with the lowest Hit Points. My ‘Average Elixir Cost’ is 4.3, which is pretty good. I have two high point damage inflicting troops in Prince and Muskeeter with decent HP so I can destroy high HP units without having to worry about splash damage spell cards taking them out. I have a Baby Dragon, Arrows, and a Fireball that deal splash damage, so I have multiple ways to control swarms or hordes of troops. I have a Giant, Prince, and an Inferno Tower that all have very decent HP so I can couple them with my Muskeeter or Baby Dragon to deal either point damage and/or splash damage behind them. I have an Inferno Tower, Muskeeter, and a Baby Dragon to deal both point and splash damage to air targets. I have Arrows and a Fireball so I can freely inflict splash damage anywhere on the field to eradicate hordes or finish off a weakened Tower. I have an Inferno Tower to defend my Crown Towers from opposing high HP troops with heavy point damage. I also have a Skeleton Army to either eat away or slow down or distract troops. It can be used for both offense and defense. And this is why I am having a lot of success with this deck as you can see from the pictures from my recent attack log below. Of course I’m not going to be able to push to the top of the leaderboards just yet since the level of my cards are still very low (I also haven’t bought any gems to speed up my progress), so I have a long way to go as the level of your cards are also very important. So save up your gold and when you have that balanced deck, prioritize upgrading those cards in your deck.